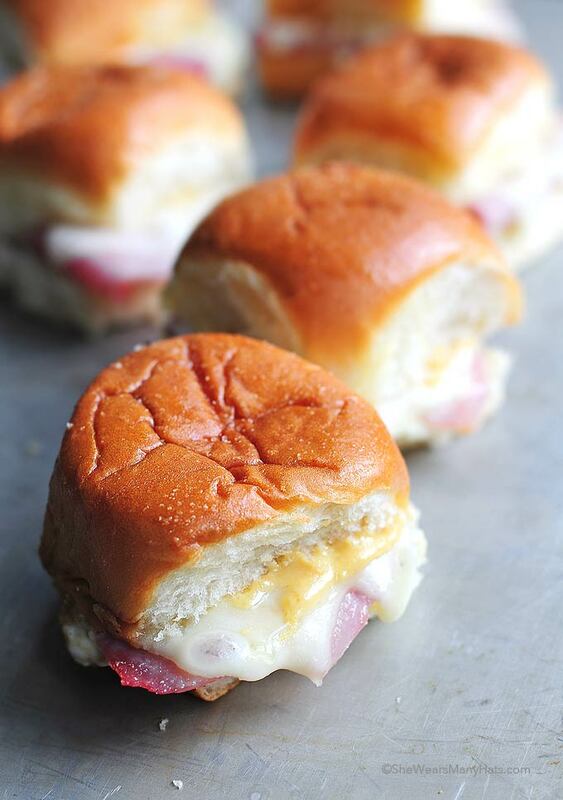 These Ham and Cheese Sliders are a lightened up and simplified version of the popular poppyseed mini sandwiches. These sliders are a great dish to serve for large groups and are very quick to make. Entertaining is fun. It’s always good to get together with others to celebrate or just catch up. 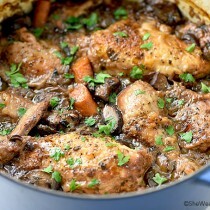 Although, sometimes cooking for a crowd can be daunting. But it doesn’t have to be. With some handy dandy and tasty recipes in your arsenal you can breeze right through the preparation and still have plenty of energy to enjoy the party too. Sliders are a terrifically simple and tasty way to feed a group. Most sliders can be prepped ahead and popped in the oven to warm, then kept there until ready to serve. 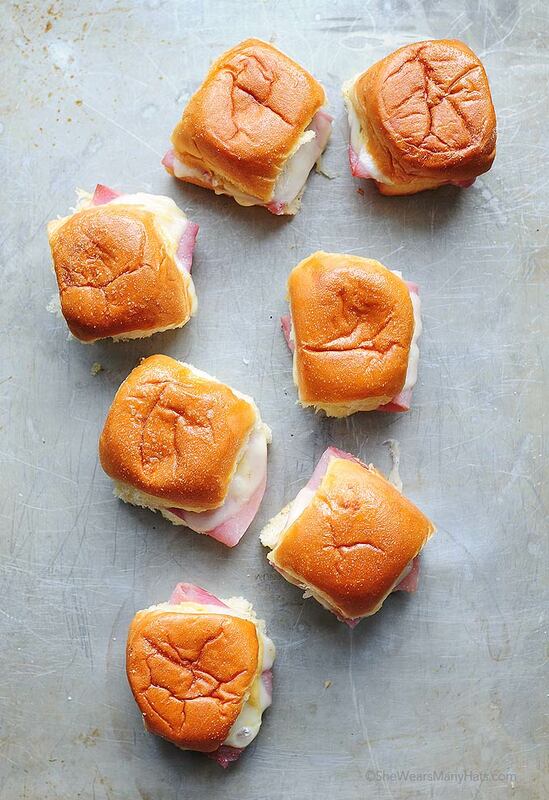 These easy Ham and Cheese Sliders are certainly one of those recipes that will please your party. 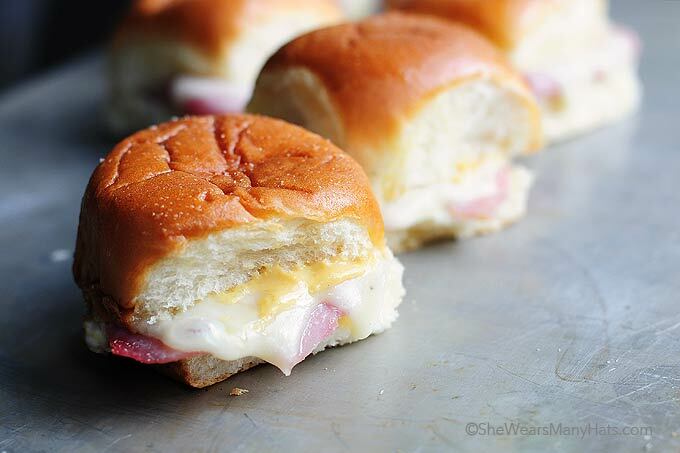 These mini ham and cheese sandwiches are super quick and easy too! If you are a fan of the popular Poppyseed Ham and Cheese Sliders I think you will find this recipe a tasty lightened up and simplified version, without the poppy seeds and extra prep time. And lighter is always a good thing don’t you think? 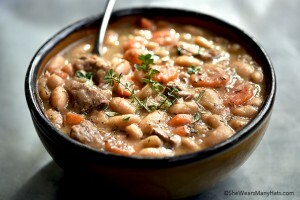 The ingredients for this version may be basic but they create a tasty combination. 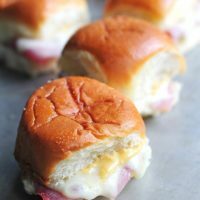 Make these Ham and Cheese Sliders for you next tailgating party or picnic and just watch them disappear. They’ll be a fan favorite! These easy mini sandwiches are the perfect party food and are quick to make. Spread mayonnaise and honey mustard on inside of rolls. Sprinkle with salt, pepper, and garlic powder. Add ham and cheese to each roll. 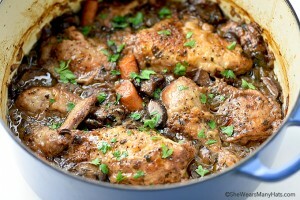 Close rolls and place them closely together in a baking pan or dish. 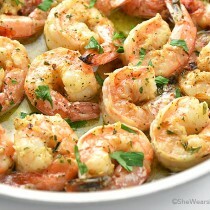 Brush tops with melted butter, and if desired, sprinkle more garlic powder on tops. Cover with foil, bake at 350-degrees F for about 15 minutes or until cheese is melted. 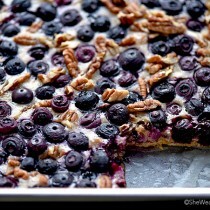 If needed make ahead of time, keep covered and refrigerated until ready to warm. These look so perfect! Would love to serve these at a party or tailgate! How easy! These would be perfect for when the family comes over for hockey nights! 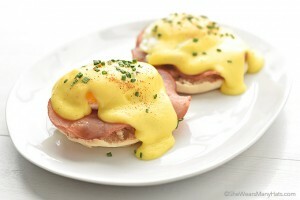 These look great – sometimes its the simplest recipes that are the best! Do you think Swiss cheese and honey ham would be alright for this? And how many slices of each do I use?